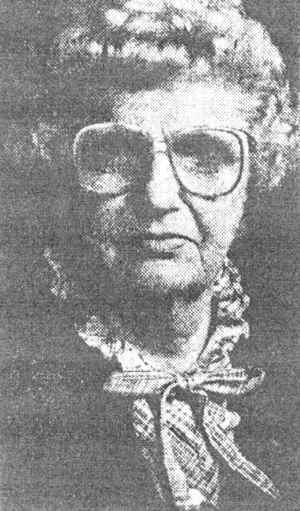 Obituary – Cain, Lucile (Lindeman) Craft « Perry High School Alumni Association, Inc.
﻿- daughter of Mr. and Mrs. F. W. Lindeman of Perry, was born in Perry on Aug. 25, 1919 and attended the elementary grades in Perry and attended high school in Perry. During her high school career she was a Red Hot. Following graduation she expects to attend college. ﻿Funeral mass will be at 10 a.m. Tuesday at St. Rose of Lima Catholic church for Lucile Craft Cain, 735 Ivanhoe street. Mrs. Cain died at midnight Saturday at Perry Memorial hospital. Rosary will be at 7 p.m. Monday at St. Rose of Lima Catholic church. Officiating for the rosary and mass will be Rev. Ward J. Pankratz, the church pastor. Burial will be at St. Rose of Lima Catholic cemetery under direction of Brown Funeral home. Memorials may be made to the American Cancer Society. 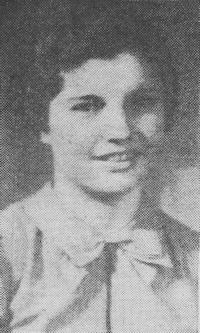 Born at Perry, Aug. 25, 1919, she was the daughter of Fred and Carrie Lindeman, She was a graduate of Perry high school and attended Oklahoma State university. She and R. F. “Bob” Craft were married April 19, 1942. Craft died in 1976. She and Jimmie Cain were married July 18, 1985. Mrs. Cain formerly was employed at several retail stores and at Powers Abstract. She was a member of St. Rose of Lima Catholic church, St. Rose Altar Society, and the board of directors of the Perry United Fund. She also was associated with Stagecoach Community Theatre. In addition to her husband, Jimmie, of the home, survivors include a son, Rick Craft, Oklahoma City: a daughter, Rebecca Hillis, Oklahoma City, a stepson, Jim Cain, Boston, Mass; a stepdaughter, Linda Blanding, Beloit, Kan.; two sisters, Ruth Queen, Perry; and Philamene Hardin, Houston, Texas. Also, nine grandchildren, Carrie Craft, Susan Craft, Ryan Hillis, Regan Hillis, Parish Blanding, Shay Blanding, Kaleb Blanding, Jamie Cain and Jennie Cain. In addition to her first husband, she was preceded in death by one son, Mark, and one sister, Mary Powers.